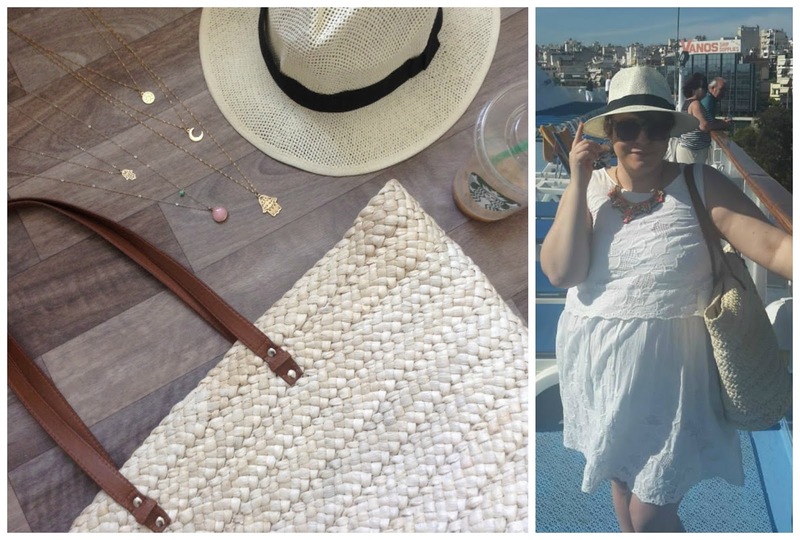 After my recent holiday to the Greek Isles, i wanted to share the three items in my suitcase that i wore everyday - these are simple essentials that complimented my holiday style. I am normally a trilby kinda girl but during the first couple of days my hubby stole my straw trilby so i decided to buy a panama hat whilst in Turkey (handmade locally and gorgeous) and have to say best hat ever! With a wider brim than a trilby i found this to be perfect for everyday and will defiantly get a lot of use even in the UK - a great stylish way to cool in the sunshine. A trend that has taken the highstreet by storm, the straw tote is a must have for any holiday. Large and roomy enough for your beach stuff or for use out sightseeing, this neutral bag goes with everything from your favourite summer dress to a pair of casual shorts and a vest. Also such a variety now available - i am totally in love with the cream and blue stripe style (above top left corner) with the fun pompom detailing, a bag that has been seen all over Instagram. The perfect finishing touch to any holiday outfits - layered chains. Whether you have a pre-layered item or simply layer up your favourite necklaces this very boho, relaxed approach to jewellery is great for holidays and is effortless chic. I really like the styles that feature moons, hamsa hands and jewels - a nice spiritual mix of charms. All of these items were worn everyday of my holiday (only 1 day did i wear a different necklace, needing a pop of colour) - the tote especially was my favourite buy. Large enough to fit all my daily essentials (camera, selfie stick, suntan lotion, water, money etc) but also stylish and chic, even hubby was happy to carry - I would like to find some cute pompoms to add some colour but overall a fantastic bag and only £8. What are the holiday essential items in your suitcase?